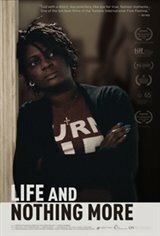 Stressed by the pressures of raising two children and getting by on her minimum-wage diner job, single mother Regina (Regina Williams) longs to find more to life than constant work, while she attempts to instill in 14-year-old Andrew (Andrew Bleechington) the values she hopes will prevent him from landing in prison like his father. Filmed in Florida, this beautifully crafted drama by Spanish-born filmmaker Antonio Méndez Esparza employs non-professional actors and documentary realism to create a remarkable snapshot of race, class and the bonds of family in contemporary America. The winner of the John Cassavetes Award at the Film Independent Spirit Awards earlier this year, LIFE AND NOTHING MORE is the latest release from CFI Releasing.